We are as good as our maps. These maps decide where we end up. The map above is a map of maps that sits on top of a stack of frames. We will be looking at the map and the frames step by step. The potential and psychodynamics quadrants refer to the internal. Perfection and performance quadrants refer to the external. The four perspectives together point to the direction to be taken for the improvement process, the journey inwards and outwards. The scope for improvement is defined by the current performance against potential of the system. Improvement is constrained by gaps in understanding / internal competencies that define the learning requirements to realise such improvements. The roadmap and metrics to narrow the gap between potential and performance emerges. The unknown is a rabid dog without its master. When it finds the master it turns into his/her most faithful ally. It is the submerged portion of the ice-berg of our self, personal and collective. The prodigal son returns to his father. It is time to celebrate, being reconnected to the roots. Farther we move away from the basic design and it remains unknown and unconnected, the scale and complexity of our challenges assume gargantuan proportions. How do we understand the basic design, our collective inheritance, and connect it to our challenges to fix the direction for a life by design – personal and collective? The four quadrants are akin to the four wheels of the car. What drives the car, the process, is the process of the self – personal /community – as the case may be. Ravana is a mythical character with 10 heads (from Ramayana, the Indian epic narrates the journey of Rama). Which are these 10 heads? How can one have 10 heads? The second head is having a map/plan as to the direction of the journey. In this case let us say we want to understand the basic design. It could as well be designing the future. The third head is the clock. One needs to keep some measure of the progress, keep counting, have some tools, technology, etc to go on the journey. Without tools where would we be? We could at best walk 20 miles a day and that would be the limit of our potential to travel for a day. In the last one decade, our internal landscapes have broadened much more than in any time during recorded history. Learning / Knowledge. Learning is equated with improvement, accumulated wisdom. Our collective wisdom has evolved through our understanding of all these levels through history and various disciplines. The journey is towards more of it in sufficient measure so that we are not victims of the unknown. There will be unknowables and room for surprises and miracles so that life does not fall into monotony and meaningless repetition, eternal recurrence. We need all the ten heads to be fully functional. Think of it as a ladder with 10 steps. Take away any one, potential is a myth. Being positioned /anchored is to place the ladder on firm ground and go up to take the eagle’s perspective. Another way to visualise it, is to see it as a lighthouse with ten levels each level corresponding to the steps of the ladder. The lighthouse does not change its position, but the sailing vessels do have to if they are not to perish. “ Dasavataram “ stands for the ten avatars of Vishnu, the ten stages of evolution of the human.http://www.scribd.com/doc/2310279/Dasavatharam.It is also the title of a recent movie by Kamal Hassan, the south Indian actor, who acts in ten different roles, avatars. Ramayana is the epic journey of Rama. (Ayanam is journey). The anti hero – is Ravana (An Asura) with ten heads who abducts Sita (the feminine) wife of Rama (masculine, an avatar of Vishnu). The choice is between turning into a 10 headed monster or to the truly human positioned to realise the design, the higher unrealised human potential. One needs to take a conscious choice to by the design than against it. Knowing is the design is a required condition. Who wants to grow into a monster intentionally? Not even Hitler would!. 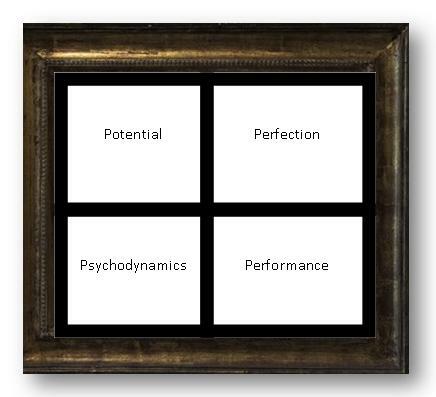 Quadrant 3 is the performance quadrant. In an ideal situation we would have had a straight line beginning from the centre and going to the opposite corner. This is the fall of man which we often view, as ‘Progress’. One can now see the gap between potential and performance – the waste in the system, the unrealised potential, the root cause of all breakdowns. To illustrate at the personal level, what is the potential vs performance of the body? Since we are all selfish this would be more appealing. I knew somebody from age 75 till he died at the age of 100 years, 6 months and 15 days. Life-expectancy in the context in which he lived is 74 years. There is a gap of 26 years when one compares his performance against what is considered to be normal. He was abnormal in a positive sense because he achieved many times more than the normal individual and was healthy and cheerful, till the very last. But for an accident towards the end, he never had to go the doctor or take medicines. Other than the last few weeks he continued to work. Why is it that there is such variance? If we visualise a future society with 100 yrs as the norm, there is a waste of 25 years. Why do such variances occur and how do you explain the gap between potential and performance? The problem is not with the potential of the body or the design, but with our understanding of the design. First problem is the knowledge hole, much more serious than the ozone hole! The human potential is something like an iceberg. We see only a small part of it. What is hidden is much more than what is revealed, far beyond all that is known to us, beyond all those who are in the Guinness book, all the great ones who have passed away or the person whom I was referring to, who lived a meaningful life for 100 years . Nothing about the past gives us any clues to this unrealised potential other than perhaps the myths. There is plenty of room for miracles to happen because a miracle is something which is unexplainable by the known laws of nature. What we know of nature is so fragmented that it does more harm than good and precedence will not take us to Mars. However the dominant thinking, the mental models of our opinion makers – politicians, economists, engineers, medical professionals – essentially follow the machine logic. It is not an unfounded fear that in some distant future, robots or artificial intelligence will take over humans. It has already done so because we are driven by the machine logic, a product of industrialisation, as our prevalent paradigm, the internal map. Are we turning into Pavlovs dogs ? The machine logic is focused on entropy. No machine can regenerate itself, reproduce itself or make a copy of it. It is not a self –regulating system though advanced machines have some limited capacities to self regulate. Economists visualise the economy as an engine and the allopath sees the body as a machine. The biologist has a better model guided by the bio-logic, in stark contrast to the machine logic. The bio-logic is about creating order, increasing self regulation as we move up through the different classes of beings. That humans do not often self-regulate does not mean that there is no potential. Entrenched habits block this potential form emergence and conscious choice is a pre-requisite to self – regulation. The cell, the basic unit of life, is negentropic with increasing order and evolution. 200 years since Darwin, the biologist does not influence our thinking to the extent that other more fashionable professions do, the engineers, managers, economists, or those in the medical profession. These are essentially derived disciplines emerging out of our progress in knowledge and there will always be a lag between new understanding and such understanding influencing mainstream thinking. One has to take position against the limits of mainstream thinking, the burden of normality, if one has to move beyond the average, a perceived normality rather than true normality. The cardinal illness is a thought disorder and other problems are derived ones from this fundamental distortion, the original sin? Nature is perfect, beyond improvement. Nurture follows from history, institutions, assumptions, habits and positions. All of these together create the knowledge hole, barriers to realising the unrealised bur realisable potential, personal and collective. This is the learning imperative, the syllabus for graduation from the school of life. Being from and of nature we are complete and whole (by design) but we seldom take such a position. We take the position that we are incomplete, sinners and wait for the second coming of the prophet, to be redeemed. Nature is always in process, of continual renewal. The ecological footprints of human interventions block renewal and we come to suffer from our own actions. It takes more than a year for nature to renew what we consume in a year and some damages are irreparable. The body is in the process of continual renewal which depends on what we pay attention to. Pay attention to entropy, decay is the result. From completeness arise completeness, growth from acceptance, being to becoming. 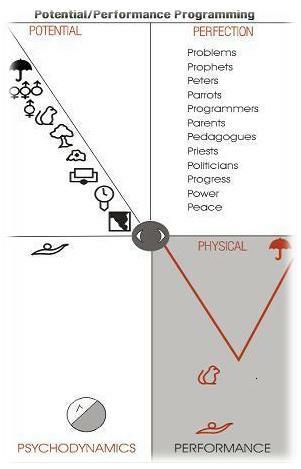 Programming – socialisation- of the individual thorough its institutions of politics, religion (priests) , education (pedagogues) parents, influences progress. To the better or the worse depends on the position one takes. Problems could be perceived as problems or as opportunities. Complexity is a challenge to those who enjoy it and a puzzle for those who are perplexed by it. The solution focus would accelerate progress and the opposite to compounding of the problems. The eagle lives on the tree near a deep well in which lives a community of frogs. None of them had ever been out of the well. The granny frog has her bedtime story telling session. The eagle could hear the stories. On a sunny day when the thermals had begun rising, the eagle swooped into the well, grasped one little frog in its claws and rose up with the thermal. The heights and the fear of death overtook the little one. The eagle let go of the frog from the heights above the well. During the fall back into the well, the frog had just a glimpse of the world outside. The eagle returned to the tree, waited for the sun to set and to hear the story of the day. What will be the story of the day? We have been collecting these stories since 1990. Initially everyone connects it in their own ways. Some identified themselves with the eagle and some with the frog and the fear of death. Learning improves our mental models. The frog in the well forms a model of the world. The eagle on the tree has a different model. When the frog is taken out by the eagle and brought back into the well these two merge to form a map of the world. The world has not changed but the models of the world have changed. This entry was posted in Accelerated Learning, Managing and tagged Accelerated Learning, Community Intelligence, Design, Managing, Maps, Mental Maps, Sustained High Performance, System/s Thinking by firstdiscipline. Bookmark the permalink. This was a perfect time for me to go through the First Discipline. Although I have gone through the first round of reading but would make effort to digest so that it becomes strength. I am sure some of the learnings through this will help me towards self improvement and help me in perform better to bridge gap between performance and design. Thanks.